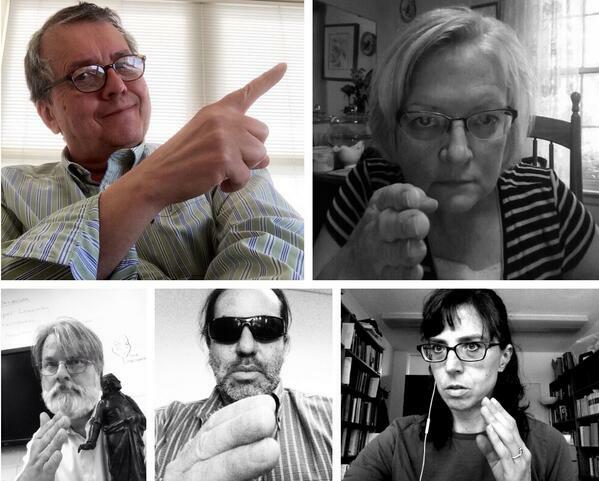 On Twitter, people lined up to emulate Douglas Engelbart’s pose. This course is open to the world … and in talking to some of the faculty teaching it, they truly desire the world to come in and interact with their students. Check it out. Today is also the first day of my summer course – ADLT 640 – The Theory and Practice of eLearning Integration into Adult Environments (and no, I did not make the course name up…just living with it). In keeping with the “thought vectors” firing around our floor, and in keeping with the practice Jeff Nugent and I have done for the past two years, I am also running my course on the open web, rather than using Blackboard. The website is http://rampages.us/adlt640/. My students will also be blogging weekly, so check out their links in the Learning Journals tab in about a week. eLearning is nearly as old as the web itself, but as with any innovation, there have been both early adopters and skeptics. As publishing and managing content on the web has become easier, and as providing online training and courses has become increasingly more popular, interest in providing elearning is high in government, the corporate sector, and education. A common (mis)perspective is that moving instruction online is primarily about designing and sequencing the content. This is wrong. Rich content is already out there. Changes on the web in the last decade – toward a more open, social and interconnected space – have necessitated the rethinking of what it means to teach and learn online. eLearning is not about content…it is about connecting people – as our new MOOC stresses. New theories are emerging regarding teaching and learning online. We will explore these theories (with a focus on connectivism) and the new practice of eLearning in my course. This course explores the theory and practice of integrating eLearning into adult learning environments and addresses the many factors that need to be considered in the design and delivery of eLearning. eLearning offers a great deal of promise to both adult educators and learners, yet eLearning must be implemented appropriately; its use integrated into well established and well-researched pedagogical practices in order to be effective. ADLT-640 will (hopefully) provide learners with a theoretical foundation and rationale for the successful integration of eLearning into formal and informal adult learning environments. This course begins with an overview of educational theory and social constructivist teaching philosophy before addressing the fundamental issues instructional designers should consider when designing, providing, and assessing eLearning. This foundation coupled with the practical issues associated with eLearning will set the stage for exploring digital media in ADLT-641, which is taught by Jeff. My course is a hybrid one, with us meeting face-to-face the first two weeks to explore the theories, then going totally online for a month to apply the theories, and then reconvening face-to-face for the final two weeks to analyze what we do and look at emerging trends. It is a fast 8 weeks! As if a MOOC and my own course were not enough, Jeff and I met with Benard Means today to set up our own 3D printer. Benard and his students have been doing some amazing work digitizing artifacts they recover from the Jamestown / Williamsburg area. We have a new MakerBot Replicator 5 which Benard helped us set up, and we immediately … and by immediately I mean over the next 45 minutes … printed out a replica of a Jamestown brass lion counterweight. 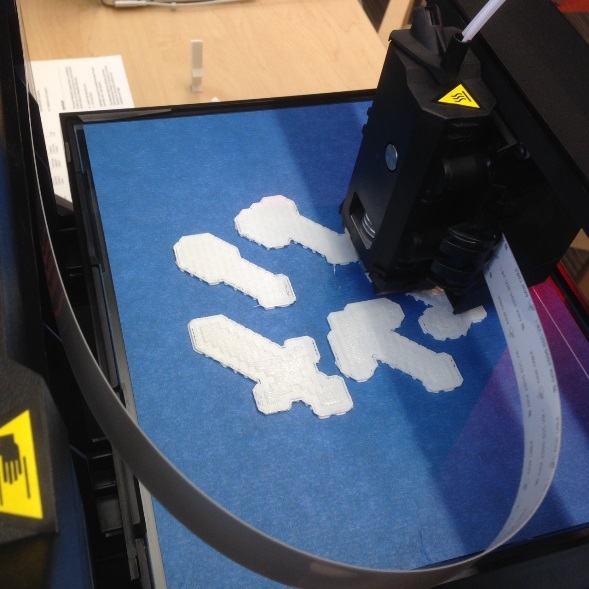 3D printing and instant gratification are not co-equal terms…but it fascinating to try. Having a 3D Maker Space on our floor might open up new learning opportunities for faculty and students. Over the afternoon, Jeff and I played with downloading scanned files from Thingiverse. Shown below are some practice prints we are doing with Minecraft gear. Whoa, 3D printer! I really want to learn how to use one of those. If you need a grad student guinea pig, OOH OOH PICK ME. I’m super excited about our class and I’ve gotten a jump-start on the blog and library reading. Sometimes I start reading and suddenly I have thirty tabs open and I don’t remember the progression from how I got from Point A to Point Zoltan 64-9. I’m hoping getting more familiar with Diigo or something will help. I tend to post snippets to a tumblr blog I keep, because Tumblr has a handy-dandy toolbar add-on button that allows me to immediately share what I’m reading, effectively bookmarking whatever I’m looking at for later deep-reading. Anyway, maybe there’s a diigo button too, I’ll have to investigate that today! Caitlin, Diigo does have handy plugins for either Firefox (what I use) or Chrome. Be happy to show you.